Former Detroit Red Wings coach Mike Babcock returned to Joe Louis Arena with his new team the Toronto Maple Leafs Friday night. The Wings extended their dominant pre-season to a 5-0-2 record with one game remaining on the schedule. The goaltending has been fantastic throughout. Jimmy Howard is poised and ready to reclaim his starting goalie tag. He went 3-0-0 in four games, earning a 2.00 GAA and .942 SP. Petr Mrazek was not too far behind with a 1-0-1 record in three games. He finished with a 2.38 GAA and .929 SP. As a team, the collective goals-against average was 2.26 and the save-percentage was .932. On the other hand, opponent’s had a collective total of 4.39 and .834. Detroit collected 31 goals in the seven games. Friday’s contest began with a flurry of goals in the first five minutes. Toronto’s James van Riemsdyk opened the scoring by putting in a rebound just 1:09 into play (the team’s first shot). Detroit’s Justin Abdelkader wasted no time responding. Captain Henrik Zetterberg set up a nice one-timer that Abdelkader was able to wrist past goalie James Reimer in the top corner. 2:50 later, Daniel Cleary set up forward Drew Miller with a great pass from behind the net. Miller quickly snapped a shot past Reimer to give Detroit the lead after one period. Whereas Detroit outshot the Leafs 14-12 in the first, the Leafs turned the tides in the second, recording 15 shots to Detroit’s 7. Mark Arcobello capitalized on a Tomas Tatar hooking penalty and tied the game. Defenseman Morgan Reilly took a rising shot which caromed off the crossbar; Arcobello collected the puck and found the back of the net. On what might have been the smoothest play of the pre-season, the Red Wings would regain the lead early in the third. 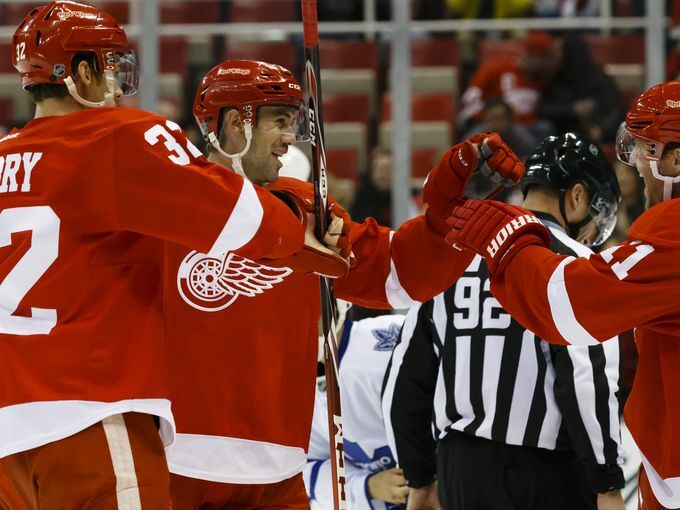 Zetterberg began the drive before passing off to newly-acquired blueliner Mike Green. Green slid the puck from one faceoff circle to the other where Gustav Nyquist was waiting for the reception. Nyquist then quickly passed back to Zetterberg, who one-timed it past Reimer. For good measure, center Brad Richards added an unassisted empty-net goal, his fourth point in three games. The game was only Green’s second of the pre-season. Howard continued his impressive pre-season campaign with the win, stopping 31 of 33 shots.